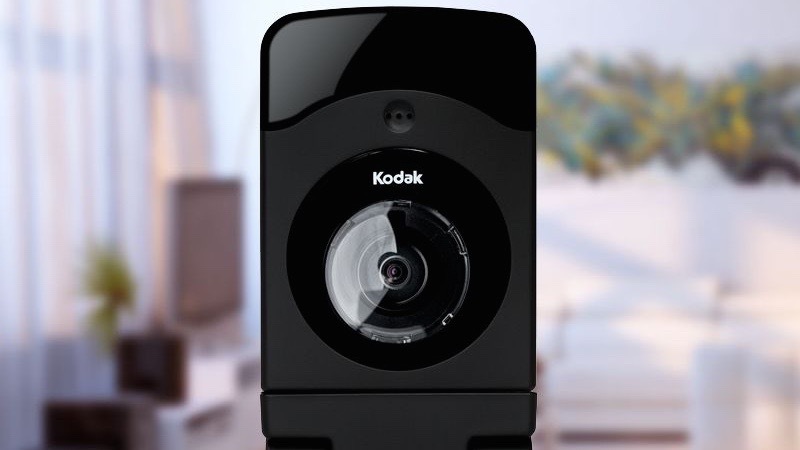 Kodak has just launched a new USB powered video monitor to compete with Google's Nest Cam. It has 180-degree field of view, a built-in Wi-Fi extender, and can run wirelessly for portability. The CFH-V20 connects to your smartphone and transmits HD streaming video, as well as two-way audio (also a feature of the Nest Cam) through the free iSecurity+ app for iOS and Android. The iSecurity+ app has its own IFTTT channel so users can set up automated actions with real-time alerts, like enabling or disabling motion detection, moving the camera, and geo-fencing, which turns on the monitor when you leave for work and turns it off when you come home. The HD camera has Wide Dynamic Range to compensate for such issues as backlighting. It also has night vision capability to see what the cat is up to while you sleep. The camera stays charged up on a USB connected base. However, you can detach it from the base and connect it to any USB power bank to place it anywhere in the house. Captured video is stored in Kodak's cloud system where users have access to the past 24-hours. For an additional monthly fee, you can extend video playback to 14 days for $9.99 or 30 days for $19.99. For $2.99 per month, users can enroll in Smart Detection, which uses UK-based Apical's ART technology to detect human presence and reduce false alarms. There is no official release date, but Kodak promises it will be available on Amazon "soon" for $149.95.